Recently, I was eating lunch with a fellow educator, and we discussed how important it is to get real, authentic feedback from our students. They, after all, at the ones that are with us all day, every day and are needing us the most! So, shouldn't we ask them how we are doing? Isn't student feedback and getting to know our students as persons and individuals what learning/teaching is all about? So, why not empower them and give them voice in their learning process AND the reflection process. 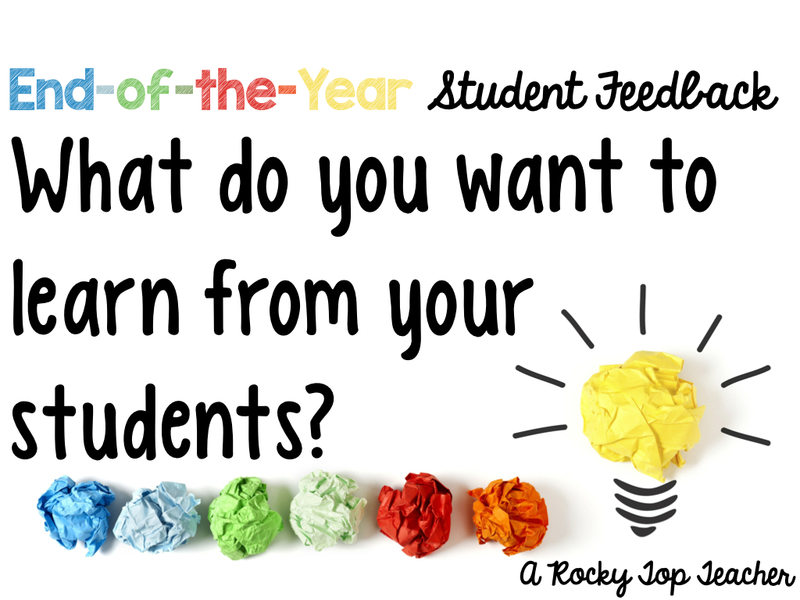 They need to have the power to offer feedback about their learning experience just like we offer feedback to presenters when we attend professional development sessions and workshops. 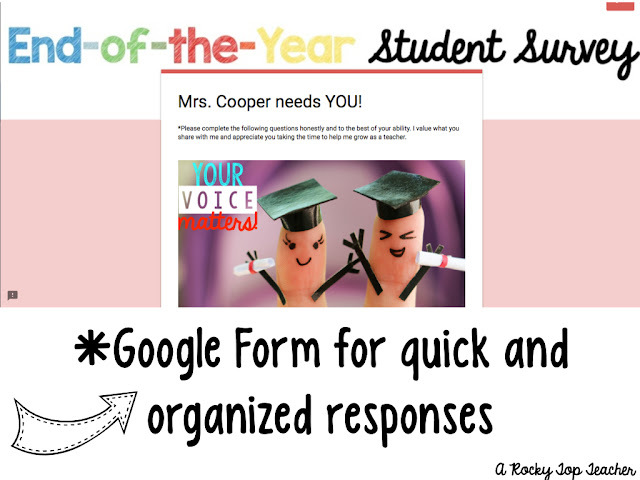 This led me to create a quick end of the year survey in Google Drive. I wanted to know what they had thought about our school year. So, I created a Google Form then added questions that were created by me, my students, and modeled from other student survey versions that I found. Before I asked the kiddos to complete the survey, we talked about how their feedback was important, valued, and would be completely anonymous. We also read through each question and discussed the different question types (linear scales and short answers). shows me that she really cares about me. *Mrs. Cooper really takes the time to get to know her students on a personal level. *I feel like my student voice matters in Mrs. Cooper's class. *Mrs. Cooper explains difficult things clearly. *Mrs. Cooper asks for student feedback regularly. *Mrs. Cooper respects my ideas and suggestions. There were also questions about our reading experience in the classroom, communication, respect, etc. One of my biggest takeaways from the entire survey was that it is SO important to be transparent and allow yourself the opportunity to recognize weaknesses and be vulnerable throughout the learning and growing process as a teacher. There were some student responses that made me what to jump for joy. My kiddos LOVED the reading environment in the classroom. They valued the read alouds and recognized that I respect them and am passionate about my job. But, I would be lying to you if I didn't tell you about the questions that broke my heart like how one kid still hated reading, another student said I didn't give enough homework, and another response was that we didn't do enough "fun" things in class. I could have stopped right there. I could have taken their feedback, attempted to understand it, and used it to reflect and regroup on the upcoming year. And, I did do all of those things. BUT, I also took the time to go through each question with my classes and ask for clarification. What did you mean by that? If you didn't like this; what can I do to make the experience better? THAT was the best thing that I could have done for this entire end of the year survey process. And, it supports my passion surrounding the idea of student voice and empowerment in the learning process. WE, the teachers, are not the focus of this educational journey. Our students are. We can learn so much and help build amazing learning opportunities for our kiddos if we just listen to them, give them the opportunity to speak and be heard, and then respect them for their opinions regardless of if we agree or not. Good for you for doing that, Sarah. It takes courage because kids are honest with you! Your post resonated with me because I got similar comments this year. One kid who surprised me by saying she still hated to read, lots of kids who appreciated read-aloud and independent reading times (and personal conferences.). But a couple said that reading in the anthology was boring and they wished I could find a way to make it more interesting. And honestly, I'm not sure how to change that up. But I heard what they said, so I'm thinking about it. So, who knows? More than anything, like you, I appreciated their honesty!